CAFOD is the Catholic Agency for Overseas Development and Our Lady of Lourdes Parish has supported their work for a number of years. 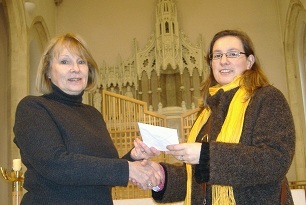 In the photograph the Parish Council Chairperson is handing a Cheque to Pat Pugh parish CAFOD rep. The current CAFOD project is Connect:2 El Salvador which aims to help communities in El Salvador, the smallest and most densely populated country in Central America. A typical village is Puentecitos, a community of 1,000 people where three-quarters of homes have no electricity or water and the average family income is just £18 per month. Despite the beautiful landscape, Puentecitos is in one of the poorest regions in El Salvador. The local economy depends on subsistence agriculture – people grow food to survive. Corn and beans are the most popular crops and people lack a varied diet. A quarter of children under five suffer from malnutrition. Education is limited. There is a primary school but older children must walk 2 miles to the secondary school in the nearest big town. A lack of employment opportunities for young people has fuelled migration.